Here’s a lightened up creamy red, white, and blue potato salad perfect for your Fourth of July celebration, or any summer gathering. Using a combination of small red skinned, Yukon and purple (Peruvian) potatoes make it attractive and festive. Like Laurie, I love potato salad and rarely make it the same way twice. I’ve made it Greek style with herbs, olives and feta cheese, Southwestern-style with sweet potatoes, as well the traditional old-fashioned kind with mayonnaise and lemon juice. This one is just a slight variation of my favorite variation of the moment, and a creamy lightened-up potato salad that uses non-fat Greek yogurt for part of the mayonnaise. I changed it up slightly by using the three different color potatoes and adding some chopped hard-boiled egg and a dollop of Dijon mustard. How Many Calories/SmartPoints in Lightened Up Potato Salad Recipe? According to my calculations each serving (about 1/2 cup) has 141 calories and 3 WW Freestyle SmartPoints. 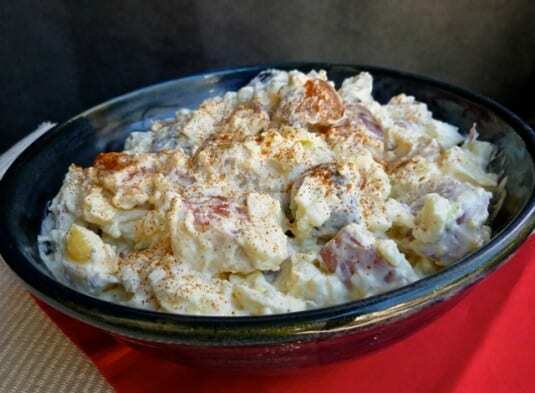 If you like this enlightened creamy potato salad recipe, be sure to check out my other easy, healthy Weight Watchers friendly recipes including Chicken Potato Salad, WW Dill Potato Salad, Slow Cooker German Potato Salad and Light & Zesty Southwestern Sweet Potato Salad. 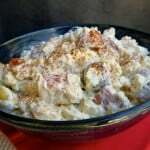 A lightened up creamy potato salad using a combination of red skinned, Yukon and blue potatoes. 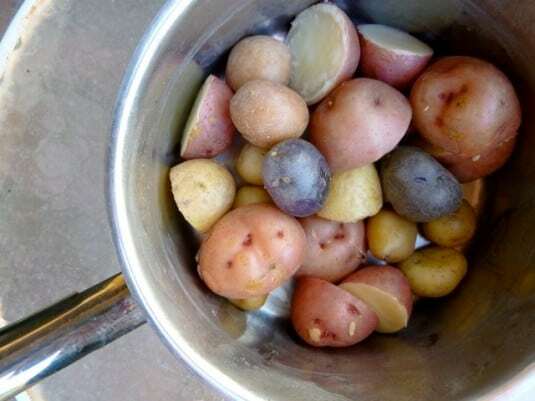 In a large saucepan, place the potatoes and just enough water to cover them. Cover and bring to a boil, then reduce heat and simmer gently until tender when pierced with a small sharp knife, 20 to 30 minutes (depending on their size). Drain and drizzle the hot potatoes with 1 tablespoon of the vinegar. Let stand until cool enough to handle and then cut them into bite-size cubes. In a large bowl, mix together the mayonnaise, yogurt, remaining vinegar, mustard and salt and pepper until well blended. Add the cubed potatoes, celery and onion and toss until everything is well coated. Stir in the chopped eggs. Cover and refrigerate at least 4 hours to chill and allow the flavors to blend.